Once upon a time when I first started playing WoW, I mentioned to my friend and WoW mentor, Mikoh, that I thought kodos were kind of stupid looking and that I wished I could ride around on a wolf instead. He assured me that this was possible, but it would be annoying since I had to get to exalted with Orgrimmar. But he mentioned that I could also get one doing PvP and that it would be “a lot easier.” Then he asked me if I wanted to do Warsong Gulch so I could start earning up the marks I would need to buy a wolf mount. I said sure, because I’m vain about things like mounts. And so, unknowingly, I threw myself to…well…the wolves. I should stop right here to say that while I’ve always been pretty good at video games, my skills go right out the window when it comes to playing against other people, unless it’s in puzzle games or rhythm games or Mario Kart. In fact, I am so bad at player versus player stuff that I’m pretty sure my badness got me a boyfriend while I was in college because he took pity on me while trying to play Marvel vs. Capcom and sat behind me with his hands over mine on the controller, trying to show me what the hell to do. My friend once knifed me to death playing Goldeneye because I was so bad at it. Seriously. I’m awful. So going into Warsong Gulch with only remedial WoW skills and horrendous PvP skills was a painful thing. But it was still fun. Kind of. I mean I was a druid, so I could be a pretty good flag carrier, especially since I had my friend defending me the whole time. I thought that maybe I could get good at this, if I practiced more. 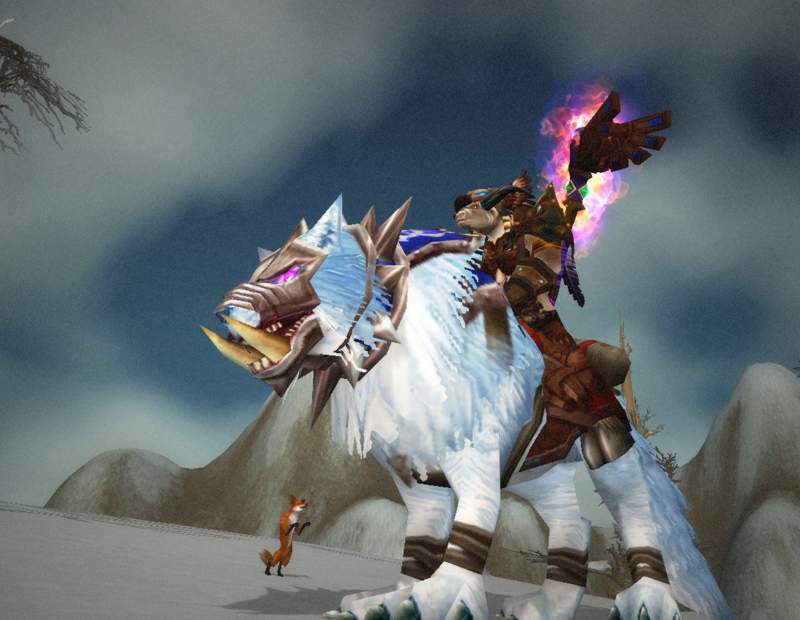 Around this time, I was looking on Wowhead and saw a wolf mount that I really liked. I told Mikoh that the Frostwolf Howler was pretty and he assured me that as soon as we were at a high enough level, we would start queuing for Alterac Valley so I could get my mount. Did I mention that this was right around when Wrath launched? So at level 58, we queued up for this battleground. I had no idea what the point of it was, but I didn’t hate Warsong Gulch or Arathi Basin. Surely this couldn’t be that bad. Except…a month after Wrath launched, Alterac Valley was filled with one thing. Death knights with death grip. Death knights with death grip with very nice armor that they got from their starting zone. Death knights with death grip with very nice armor that they got from their starting zone that were still at that point totally OP. GNOME death knights with death grip with very nice armor that they got from their starting zone that were still at that point totally OP. I died. A lot. I died a lot to the point where it wasn’t even fun. Sure, I understood that PvP meant dying a lot, but I was literally getting ripped from one gnome death knight to the next every time I rezzed. It got so unfun that I eventually told Mikoh that I could do without the wolf and vowed to never set foot in that place again. A year or so later, I was playing my paladin a lot and decided I had to get the violet protodrake for her. She was my miner, after all, so that 310% mount would be very handy. So I started working through the achievements, hating the PvP ones and generally cursing about them. Once I completed School of Hard Knocks, I pretty much stated in no uncertain terms that if I ever PvPed again, it would be a sign of the apocalypse. And then came the Cataclysmic set. Never before had I seen such an amazing set of paladin armor. The details…the style…the giant metal boots and non-matching shoulders. The broken halo. It had to be mine. I promptly forgot about wanting that armor and only about a month ago realized, crap. I had wanted to convert valor to conquest so I could get it and had totally slacked off on running randoms and LFR to get them. And though I didn’t think that Blizz would remove it come Mists there’s always that possibility. They sometimes do weird things with PvP gear. So I started working harder at collecting the points. I realized if I wanted to get everything before the expansion, I had to do some actual PvP to get it. So my friend crafted me the healie pvp stuff and I reluctantly queued up for a random. It wasn’t quite as terrible as I remember, but it still wasn’t fun. I decided again that PvP wasn’t for me and figured I would just collect as much of the set as I could by doing PvE. Then one night after a raid, the Alliance started to attack Orgrimmar. Usually I just ignore them, but a couple of my guildies decided to get involved, and so on a whim I switched to my holy spec and shiny new PvP gear that I hadn’t really used for actual PvP. And…and I had fun. It was fun swooping in to drop a Lay on Hands on my friend when he was about to die. It was fun standing in the back while the two of them killed the people who were trying to kill me. 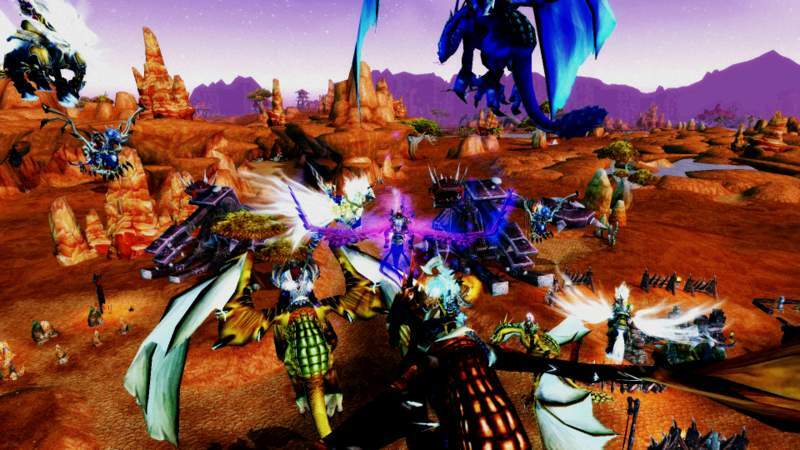 It was fun eventually chasing the Alliance halfway to the Barrens and “winning” the battle for the night. I had no idea what to make of this. Last week I realized I was just 100 conquest short of being able to pick up my chest piece, so I shrugged and queued up for a random battleground again. We won. There was actually teamwork. Chat wasn’t filled with swearing or douchbaggery. I glanced at the scoreboard at the end and….holy crap, I had topped it on healing? What the hell was going on? I don’t like playing as holy OR doing PvP! In a stunning turn of events, we lost horribly and I decided I was done for the night, but something really odd was happening. I kept thinking about PvP. In fact, after I logged off I started looking for information about gemming and PvP holy builds. 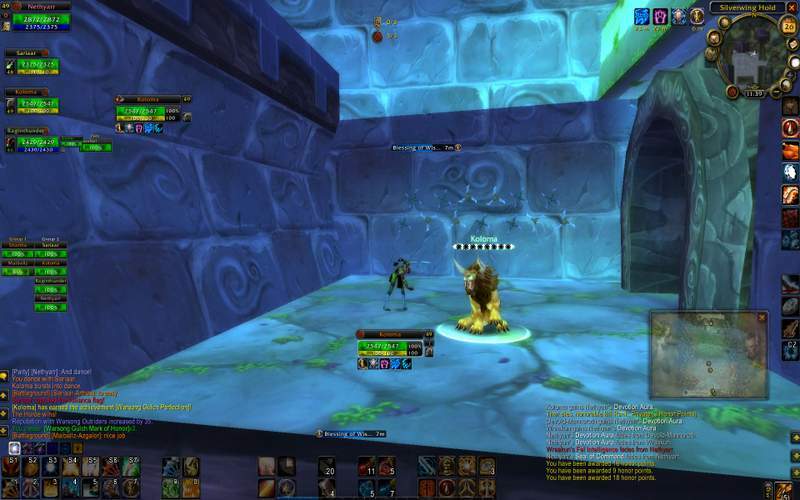 I signed back into WoW to tinker around with my UI to make it work better. Then I decided that I’d officially gone mad and went to bed. Because I hate PvP, right? The next day the same thing happened. I queued, we won, and I think I did pretty well. People were staying alive anyway, and I wasn’t dying too much. I started to remember to use some of my awesome pally tricks to stay alive longer. And since I’m healing, I don’t really care when I do die. I’m a healer. That shield on my back is actually a giant bullseye. Of course people are going to kill me. But man is it fun to annoy them to hell and make fights drag on and on until my teammates show up to defend me. My personal moment of victory? When a gnome death knight could not kill me no matter what he tried. I was sitting at my desk giggling like an evil villain the entire time. So…I guess I like PvP? I don’t have any other explanation for why I’m sitting here reading up on strats for all of these battlegrounds that I swore I didn’t care about. I just thought I should give you all fair warning. If I’m having fun PvPing, the end of the world must be just around the corner. And yes…I did eventually get my frostwolf.